The WE Power Strip Series represents the world's most versatile and configurable universal power strips. Its patented modular receptacle framework and interchangeable power cord design make it possible to configure the WE series power strip with different number or different types of Wonpro universal receptacles and easily detach its power cord and change to another country type. 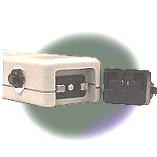 The unique design lets you convert any single country-specific outlet into multiple universal ones. It is the ideal power strip to bring with you when attending overseas exhibitions and conventions. All 6-gang WE-series power strip models come with built-in surge absorber and circuit breaker for your maximum protection. The patented detachable power cord design is made possible with our WSP/WSR secure locking plug and receptacle. With a simple slide-to-lock or unlock motion, you can easily replace the power cord of a WE series power strip from one country type to another in seconds. 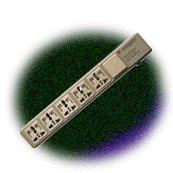 This unique design vastly increases the configurability and applicability of the WE series power strip for all situations. The picture here shows how the WE power strip can be easily configured with different power cords such as the WE-109 for German, French, Korea, etc, or WE-107 for UK, Hong Kong, Singapore, etc, or WE-105 for USA, Canada, Taiwan, Japan, etc. for Taiwan, Japan, USA, Canada, etc. For England, Hong Kong, UAE, Singapore, Malaysia, etc. For Germany, France, Holland, Spain, Korea, etc. For Germany, France, Holland, Spain, etc. For Russia, and some Middle East, East European, and South American countries. for India, Hong Kong, South Africa, etc. For Australia, New Zealand, China, etc. For USA, Taiwan, Japan, Canada, etc. Copyrights 2002 Wonpro International LLC. All Rights Reserved.